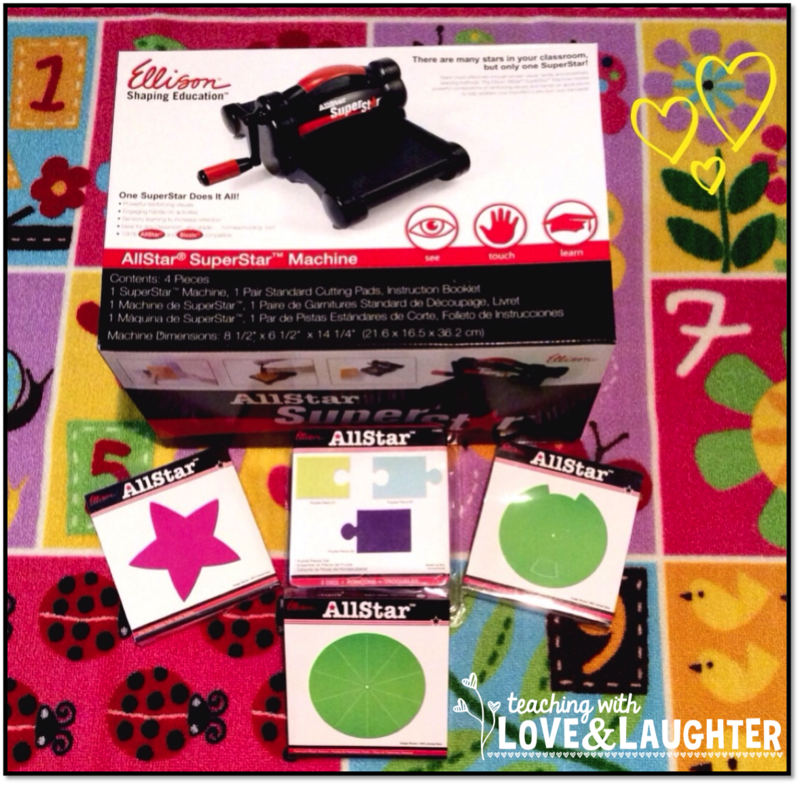 Teaching With Love and Laughter: Ellison AllStar Machine Review and AMAZING Giveaway! Ellison AllStar Machine Review and AMAZING Giveaway! I have been a HUGE fan of the Ellison Press since I started teaching back in the 90s. All the schools I've worked at since then have had a few presses and lots and lots of die cuts. I have used them for EVERYTHING! Labels, bulletin board decorations, games, certificates, design elements in class books, etc. I have been a very happy and satisfied puncher for many, many years. Well, imagine my surprise when the company emailed little ol' me and asked me if I would be interested in getting my OWN press and some die cuts and reviewing everything on my blog! What a total dream come true! They sent me the very lightweight and portable Ellison AllStar SuperStar Machine! And this machine is a true SUPERSTAR! All I had to do was take it out of the box and attach the handle. Then, it was ready for action! Ellison let me choose some die cuts and I chose the puffy star, 3-piece puzzles, and the flashcard reel top and bottom. The machine is super easy to use. All you do is fold your paper in half, lay it on top of the die cut, foam side up, and sandwich it between two acrylic sheets. You crank it through the machine, which is very easy and incredibly quiet. You can hear a slight crunching sound as the die cut does its job. Once your sandwich reaches the other side of the machine, you are done and left with a perfectly cut design. Below, you can see some CVC word puzzles I made for my kindergartners. I also added blends and digraphs. 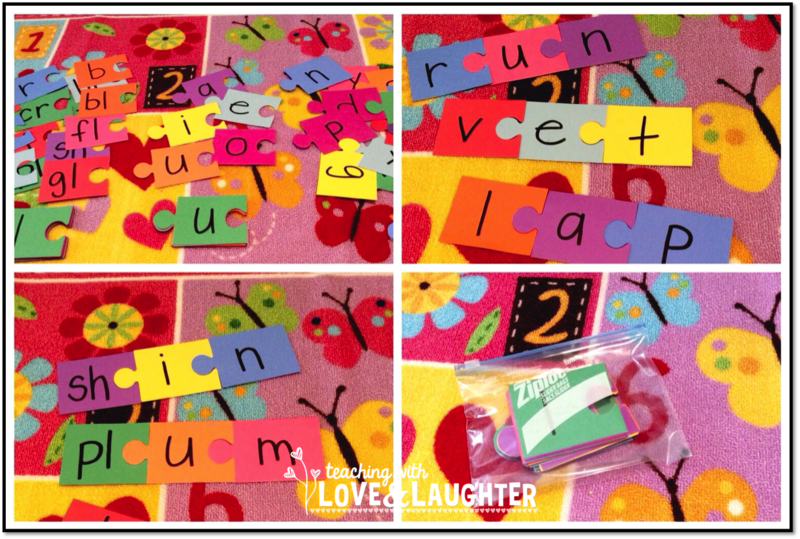 My students LOVED putting the puzzles together and making lots and lots of words. 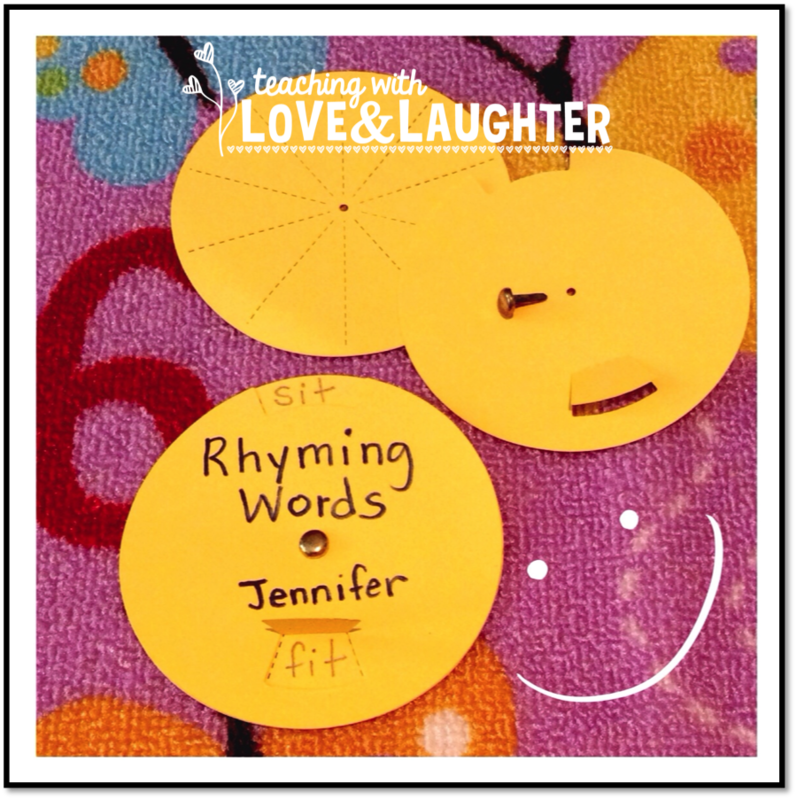 Here is a sample of how I used the flashcard wheels. Ellison has tons and tons of different die cuts and it was very hard for me to choose which ones I wanted for this review. I am looking forward to getting a few more to add to my collection. Would you like to start an Ellison collection too? Well, this lovely company knows that everyone will enjoy what they have to offer, so they are very generously allowing me to give away an AllStar Machine and some die cuts of your choice to a very, very lucky follower! This giveaway is worth over $200! Wow! Just use the rafflecopter below to enter with integrity. Good luck to you! I love your blog, and I love the Ellison machines! The puzzle pieces would be great to use for many activities. This would be so cool to win!! This is so wonderful!! You are one very lucky lady, hopefully I can be as lucky! This would be a great tool to win!! To have one at my own house would be perfect!! Thank you for the terrific giveaway!! I love Ellison!! They make the most amazing products. I was able to get two different schools I worked at to buy their machines and dies. I also love following you on all social media sources! Thank you for all of the great ideas and inspiration!! Oh how I love giveaways, especially if I win them!!! Would love to win this for my classroom. I can think of so many things that I could use it for. My kids just love center time and this would be great for that!! What an awesome product and company! Would love my own set to share with my teacher friends! Oh this is very exciting! I'm graduating with my bachelors in Elementary Education this May so I'm trying to stock up while I can! Absolutely amazing product! I don't usually enter any giveaways, but I thought I should take my chances with this one. This is the first time I've heard of this company, and this product. Would definitely be a wondrous product to start off my new teaching career with! :) Glad I at least came across this opportunity! I'm going through this blog as well, and it's amazing! Glad I came across this! Definitely favoriting. Love this!! Would love to have one! I'm so glad I found your blog. I am always looking for great tips to use in my classroom. Love all of the activities you made with the Ellison! I hope I win it so I can make some, too! I love the puzzle pieces! What a great giveaway! This would be so awesome to have in the classroom or at home instead of running to the die-cut machine in the library when free time arises. Too cool! I would love to win this! Perfect for creating station activities for my kinders! I would love this to use in my classroom. Never seen this product before? Curious what it all does. At my school, we have a very dated die-cut machine but only alphabet letters to use with it. Obviously with zero school budgets, that it not at the top of anyone's priority list. I've started collecting my own mini office at home: printer, paper cutter, laminator.... this would be lovely to add! I think this is great for any age. It is nice when you can add some color and life to your classrooms and lessons, even for the older students. Thanks for the opportunity to win an Ellison. Thanks for showing what it can do! Hey you, it's been TOO long! Thank you so much for this great chance to win such an awesome product. Hope all is well with you! I love all of your shopping ideas. We are losing our construction paper machine this summer so the Ellison would come in handy!!! Thanks for all of your great ideas! This would be great to have for my kids and making games for them would be fun too! I'm graduating in May and will be a first year teacher in August. I love using the Ellison machine at my current host school. I would love to have my own machine! It is so versatile and a great way to show off my creativity! I love making fun stuff like this for my Title reading kiddos! This would be perfect. What an awesome giveaway! I love their products!!! Love your blog. So excited about the Ellison machine. My school does not have one, so it would be awesome to win. wow, I've seen all, well almost all your works , comments about using some tools, i wish i got lucky with this fenomenal! device. Thanks so much for the opportunity to win an Ellison! I love your blog!! Thank you for posting about this giveaway!! I would love the opportunity to use one!! Thank you for this opportunity! I would love to win this. Thanks you for the chance to win this! Love your site! Haven't had access to one of these for years...would love to win one! This would be so wonderful to have! 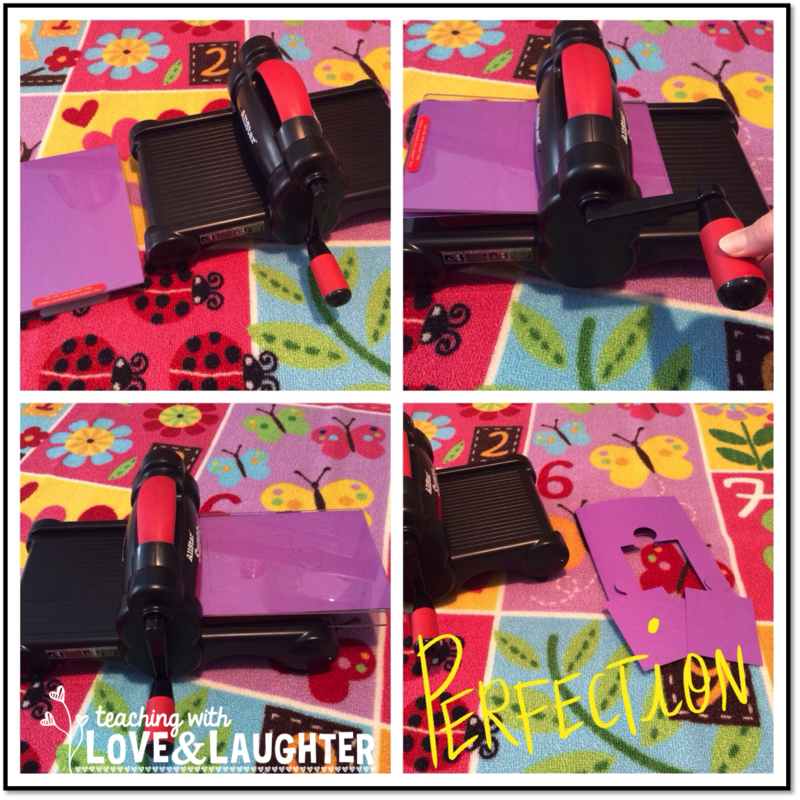 I bought a Papermonster laminator for the home and to win the Ellison Machine, I then have the tools at home that make lesson planning/prep so much easier! We moved several years ago due to my husband's job and the school I am currently at does not have an Ellison Machine. :( This is the first school I have been at that does not have this great device. The last school I was at had so many wonderful die cuts and seeing all the creative ways that you are using yours makes me yearn for an Ellison Machine even more. I love the Ellison machine! I would love to spend a week in your classroom, Lori! 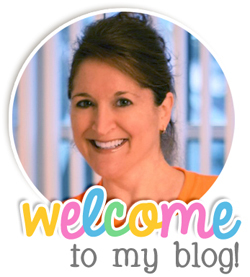 I am an avid follower of yours through your blog,TPT store, Pinterest and Instagram. Oh, I sound like a stalker! I'm an Ellison user and this would be a great tool to have in my room. My firsties would love to be the Ellison helper of the week! So many great ideas! Always an inspiration to me and others, thank you. Wow! How cool! I am imagining all the fun ways I could use this in my own Kindergarten class! Thank you for organizing this and sharing your ideas and love of teaching with us! You have such wonderful ideas! I would love to have an Ellison press. I have used one before and it was very useful for teaching. I love this! This would definitely benefit my fabulous first graders! I would love to try out Ellison! This thing looks really cool! Thank you so much! I would love to win! I love your products and this one. I appreciate the time and care you put into your blog and products. I love your blog! The Ellison Machine looks very interesting! Must be great to use in the classroom! Thank you for the opportunity to win the Ellison machine! I enjoy receiving your newsletters and popping in to check up on your blog when I have a minute. You're inspiring and entertaining at the same time!! I've recently stumbled across your blog and am so glad I did! That Ellison looks like a great gadget to have around!! I am a secondary teacher but I enjoy pulling the creative elements from elementary into my classroom!! The puzzle piece have so many uses, love your blog! Love this blog! There are always so many helpful ideas for assisting in the education of our students. As we all know, " it takes a village." The Ellison looks like a dream tool for the classroom. Would love to win it! I love this! I think if one day I don't get lucky and win one, I'm going to save up and buy one! What a fabulous giveaway! Thanks you for the opportunity! Your blog is very helpful! The ones at my school are no longer sharp enough...having my own would be fabulous!!!! This would be great! I used to have to travel 45 minutes until I just gave up! It is fabulous! The thought of being able to do this in the convenience of your own home is so exciting! I would love having one of these. I love the puzzle pieces and am thinking of lots of ideas for games for my kiddos! Thanks for the opportunity! I would love to win the Ellison machine! It would cut down on all of the cutting I have to do! Would be so cool to have. I would love to win this Ellison! The one@school is so old! This is such an awesome giveaway! I would love to use this for my classroom! Wow...this is incredibly generous of you, Lori!!! I am obsessed with decorating and making things for my classroom, and I am a HUGE fan of Ellison's die-cut machines!! I would absolutely LOVE to be the EXTREMELY LUCKY recipient of this <3 <3 <3. Thank you for considering me...as always =). leafsgirl@rogers.com. I love your ideas. I wish I had at least a quarter of your creativity. Thanks for sharing. As if your blog isn't already wonderful enough, now you've gone and got me all excited about this fabulous giveaway! Thanks so much for giving us all the opportunity! Oh the endless possibilities!!! Thanks for the offer! I am so excited about this give away. I teach in an inner city school and we do not have one of these . I often ask my sons kindergarten teacher to cute things out for me. This would really be a wonderful addition to my in need school. This is sooooo amazing! I cant believe I have never heard about this before! You have some of best ideas! I love coming on your blog and finding ideas for my FIRST classroom :) Thanks!